Here's a nice little run if you're staying in Melbourne's Central Business District. 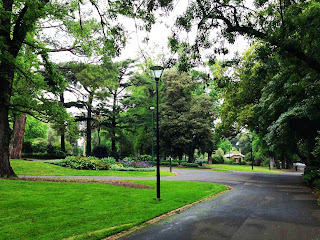 Fitzroy Gardens and the adjacent Treasury Gardens and Parliament Reserve are a varied and green contrast to the urban downtown directly south of the parks. 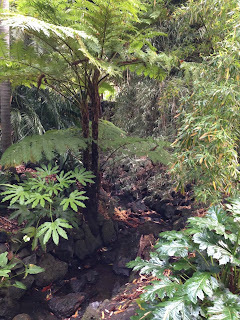 Fitzroy Gardens is a nice little park, full of huge trees and jungles. Looking at GoogleMaps, it looks like a really boring park: a rectangular lawn with a few criss-crossing paths. But it's actually a bit hilly, and full of little surprises. 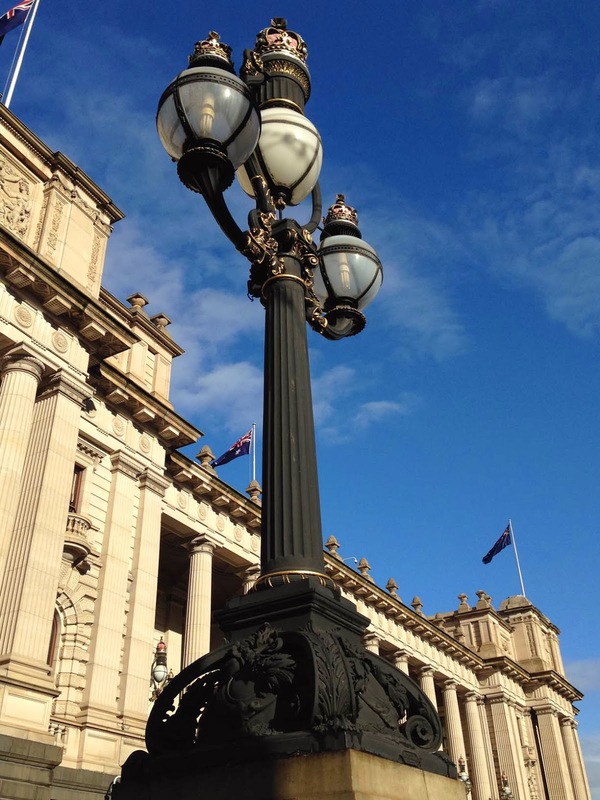 We'll start the run at the corner of Bourke St. and Spring St., right in front of the Victorian Parliament. Face Parliament, turn left and run north along Spring Street until you come to a gate in the fence along the right side, leading into Parliament Gardens reserve. 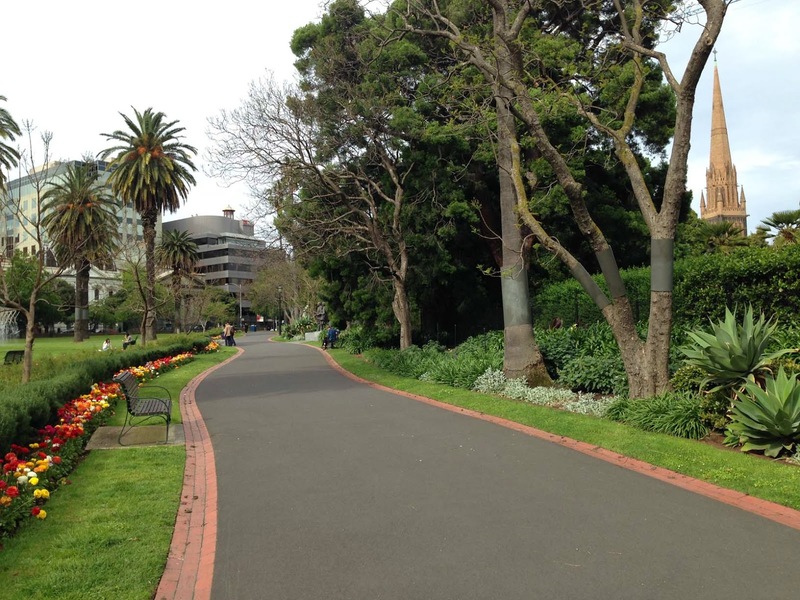 This is a small park, with just one path heading northeast to Albert Street. You'll run by some squawky parrots overhead in the trees, and there is a big fountain that looks like the shower room for a sports team. If your hotel showers aren't that good, you might want to try these. 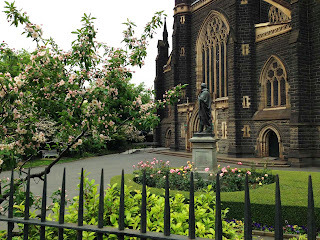 When you come to Albert Street, keep running east to the 3-towered Catholic cathedral, St. Patrick's. 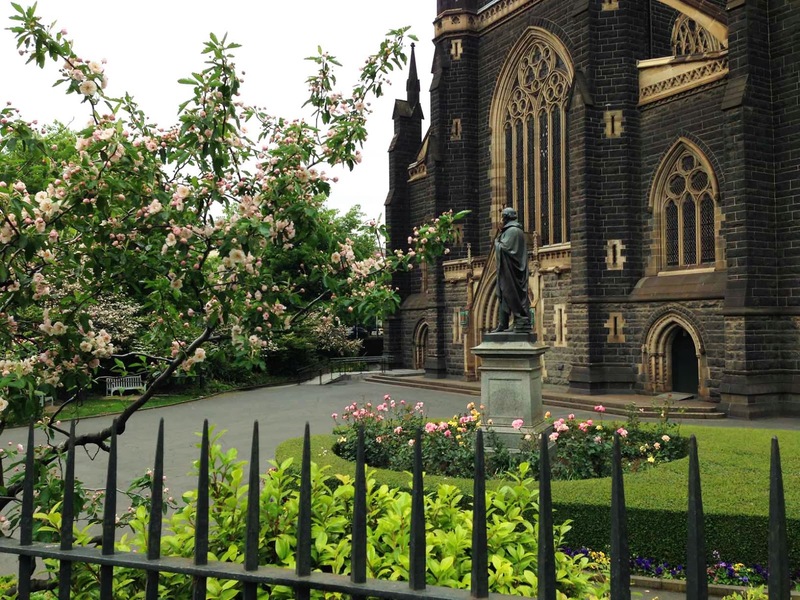 Turn right at the cathedral, onto Gisborne Street, to run along the cathedral fence, with its big rose bushes. When you get to the main entrance of the cathedral, turn left along Cathedral Place and run along the church's quiet south side. You'll go by the church gardens and a fountain. 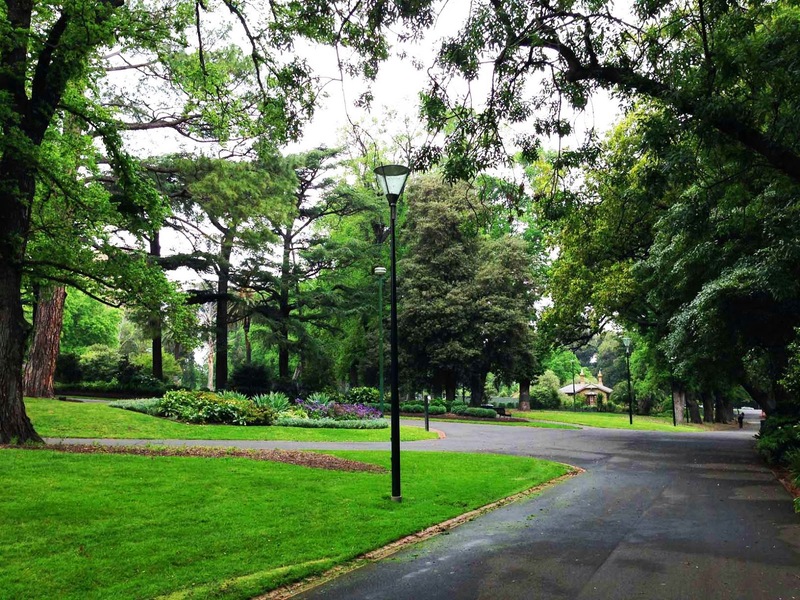 You will now run straight into a side entrance of Fitzroy Gardens. Take the path curving along to the left, along the park's north side. 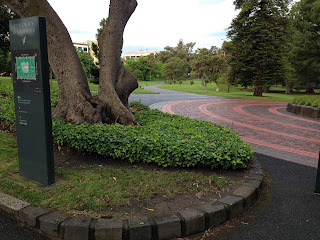 It will go by a Neptune fountain, then curve to the right towards a second fountain at the east edge of the park. Fitzroy: follow that paved path! You'll see a Greek-style pavilion there. Just before the pavilion, take the path to the right to run back westwards across the park again, crossing the main path in the middle. You'll see a pond coming up on the left, and a mound behind it. Turn left onto the mound and run south, past the pond. 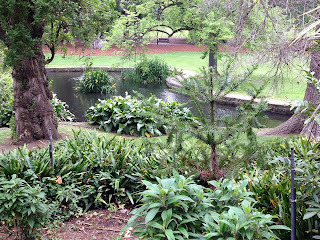 When the mound almost flattens out to the general ground level, turn left across the grass to the little wooden bridge. 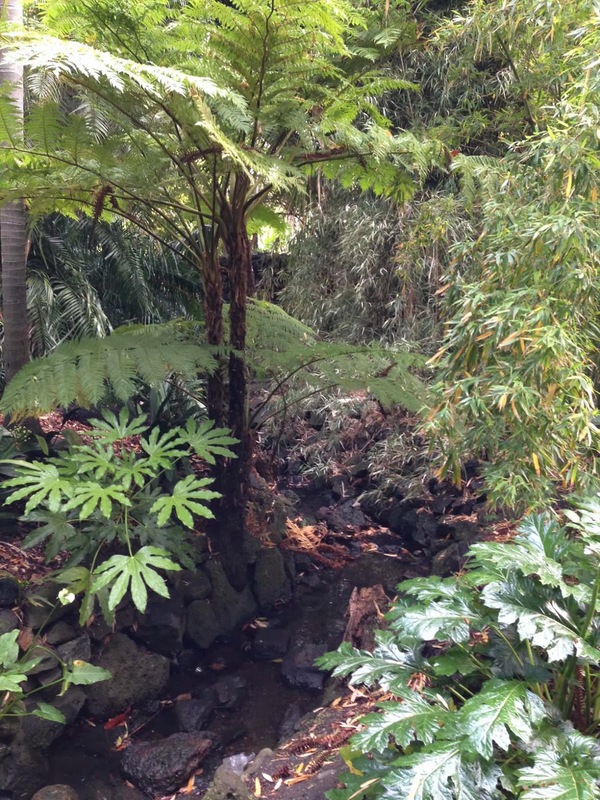 The bridge covers a little stream lined by bamboo. At the other side of the bridge, immediately turn right to follow the little path along the stream, with the stream to your right. You're running south. When you come back onto the paved path, turn left to cross the stream and now turn right follow it on your right side, continuing southwards. The path will then come to a formally landscaped pond. 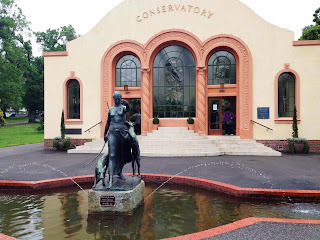 Run by the pond and continue past the little brick house. This is Captain James Cook's childhood home (moved here from England). Now turn your back to the cottage and run westwards. 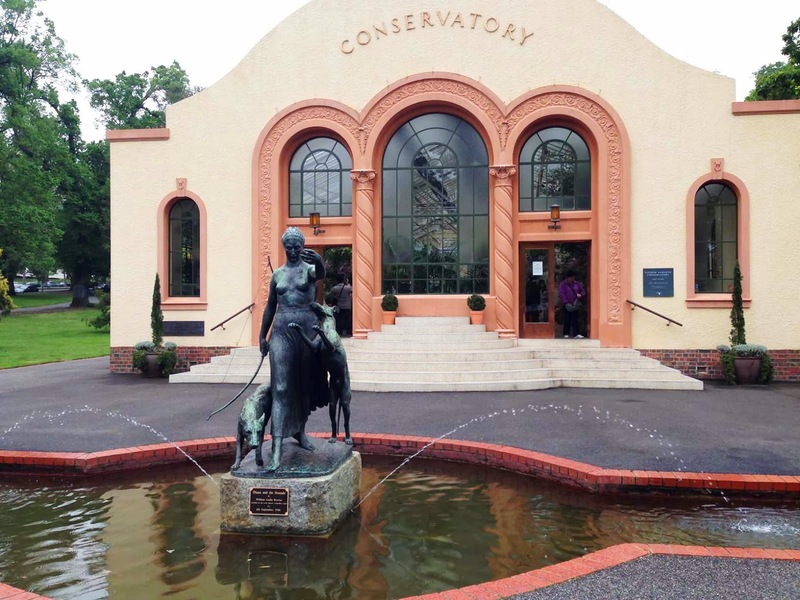 You'll go past the park's Mediterranean-style conservatory, where they have a greenhouse for flowers, and cross Lansdowne Street, entering the Treasury Gardens. Keep running straight west through this small park, running uphill. 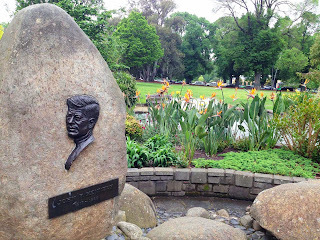 You'll see another pond to the right, nicely landscaped, with a John F. Kennedy memorial. 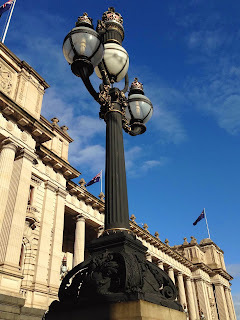 When you have crossed Treasury Gardens, you'll hit busy Spring Street, where you turn right and run north path the old treasury building, heading straight back to the starting place in front of Parliament.